Including your dog in the Christmas day celebrations is easy, thanks to the wealth of wonderful doggy dinners and treats out there. 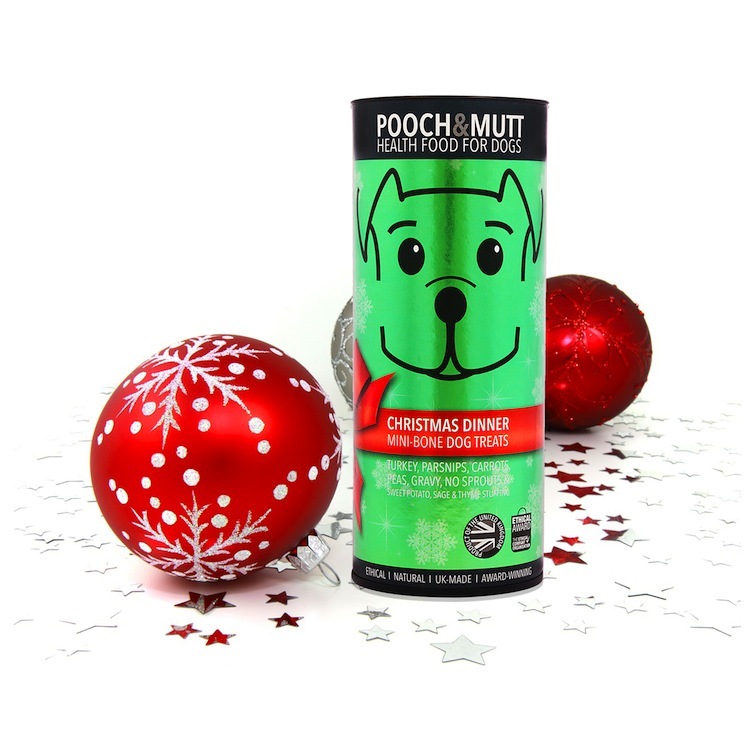 We’ve rounded up a small selection that will keep your loveable mutt licking his lips through the festivities. This limited edition lip-smacking packet is filled with 75% turkey (a low-fat source of protein) plus cranberries and parsnips for a dose of healthy vitamins. 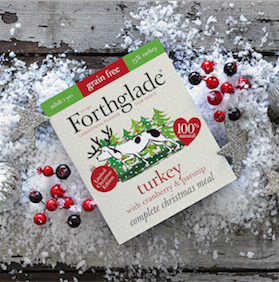 As with all Forthglade recipes it contains no added fillers, artificial flavours, colours or preservatives. It’s also grain-free, so suitable for sensitive tums. 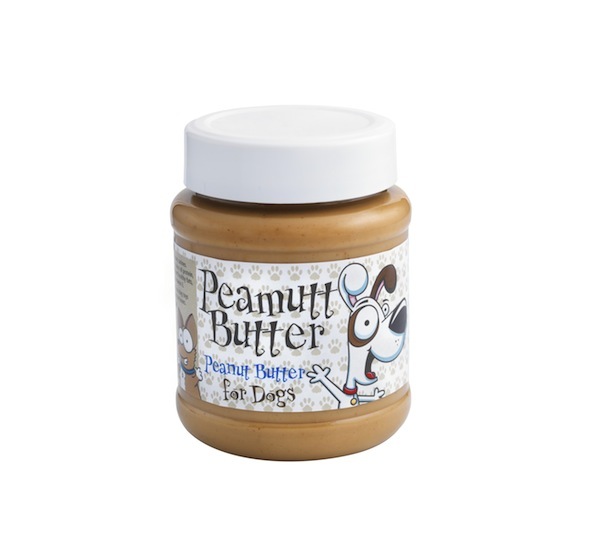 While you’re tucking into Christmas Pud, your pooch will be going nuts over some Peamutt Butter stuffed into a chew toy for his dessert. There’s no added sugar or salt in this recipe. Tick. When it’s time for you to chill out with cheese and biscuits, make your hound happy with his own Fabulously Festive Biscuits with Turkey, Cranberry, Thyme and Cinnamon. Yum. 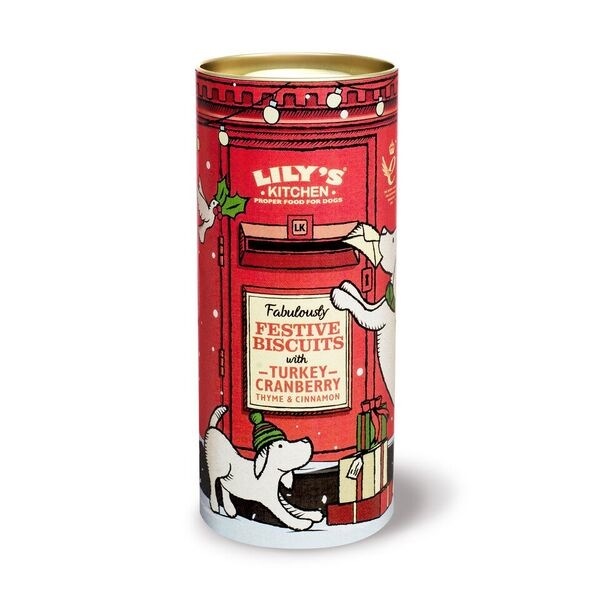 These, from Lily’s Kitchen, are filled with natural and organic good-for-dogs ingredients and come in a lovely pillar-box tin you can keep to fill up with more treats when they’re all gone and gobbled up. Festive fidos needn’t feel left out when you’re scoffing on chocolates. With Turkey, parsnips, carrots, peas, gravy, NO SPROUTS and sweet potato, sage & thyme stuffing, these organic and grain-free treats are guilt-free and only 3 calories per mini-bone. If only selection boxes were so saintly!